For those of you who were not able to make it to the Vision Expo tradeshow in New York (or if you made it to the show but need a refresher) we wanted to share the products that were best sellers among the show attendees! The perfectly lit display! With its 10” deep shelves and inset LED light strips the Delta shelves are the perfect attention grabber! There are 2 variations to pick from; the 3-shelf option which is best when you already have lighting from above or the 4-shelf option that is a great way to illuminate all the shelves while still having a space above for marketing materials! 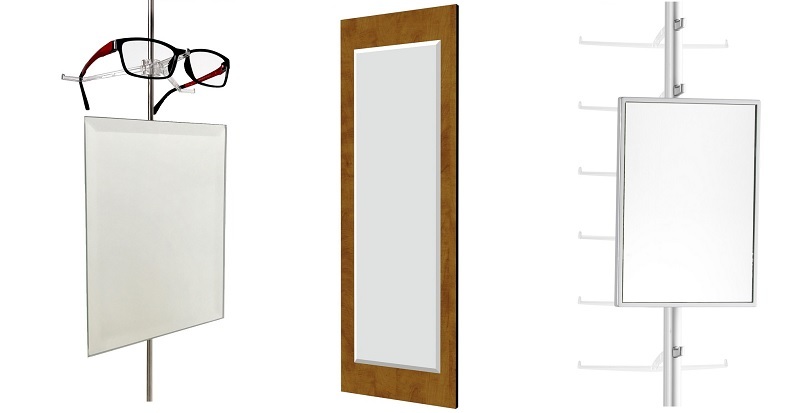 The Delta shelves works best mounted to laminate wall panels! Acrylic panels make the perfect addition to any office for a feature display area or the entire space design. They are available in a wide range of standard sizes but are also customizable! Ice Cubes and Ice Panels come in frosted clear or frosted green and can be mounted directly to drywall using our aluminum finish standoff mounts or pair nicely with laminate wall panels to give you more depth and flexibility. Visual Presentation is the cornerstone of effective merchandising. Whether you are creating collections of eyewear to display under glass counters or presenting high end eyewear to your clients, our collection of suede frame trays provides the perfect arrangement. Space limitations are what we see all the time when it comes to contact dispensing. To help resolve this problem, we have combined the workhorse features of our Classic Dispensing Table with the addition of a tissue dispenser and two stainless bowls for fast and clean trials. A single drawer on the dispenser side of the table allows for any forms or aids needed in the dispensing process. Our three most popular frame rods are by far the Mino, Alumina, and Seattle Slim! All three provide a clean and modern presentation to showcase frames, whether directly on the wall, on acrylic panels, or mounted to laminate panels! While the Mino and the Alumina provide the ability to lock the frames, the Seattle Slim gives the flexibility to remove nasal as you sell frames or rotate the frames to showcase temple details. We hope you enjoyed the recap of our best sellers from the show! Visit our website www.ennco.com to purchase your own displays today! Redmond, WA, March 2, 2017– Ennco Display introduces two new glass shelving options to satisfy a returning trend in eyewear merchandising. 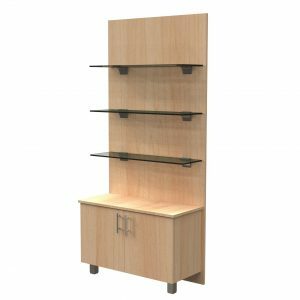 These new panel shelving systems are designed to give retailers maximum flexibility to show frames “Flat” on shelving or “Elevated” on countertop displays. The COVE was designed to allow customers the ability to showcase their merchandise with counter displays and point of purchase materials. Ennco’s Tray Elegante, Showoff, and Angler displays are perfectly suited to maximize the number of frames shown on the deep 10” shelves the COVE series provides. The MIRAGE was designed to create a boutique look with more shelves in a tighter array which allows for the perfect spread of horizontal minimalist frame presentation. The MIRAGE series focuses more attention on a single frame by providing a shallower profile of glass and less visible hardware. Jan Ennis, President of Ennco Display, notes “Store fixturing is much like clothing styles…the methods change about every seven years. Frames held by wires, pegs, rods, panels and glass shelves have all been part of the changing style of display. 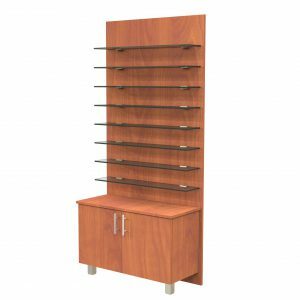 Shelving is back in vogue as more point of purchase and counter displays have been made available to the industry”. The COVE and MIRAGE shelf packages can be found on Ennco’s website and purchased directly from their new dynamic online ordering site www.ennco.com. Ennco Display Systems is a store fixture and office design company specializing in retail optical environments. The Company’s products and services are designed to aid both individual optical practitioners as well as non-optical retailers of eyewear in creating the most effective visual presentations. The Company’s offerings include both architectural and product design as well as the fixture and casework solutions needed to optimize customer interest and balance practical concerns.